Are you on the right path to get where you want to go? 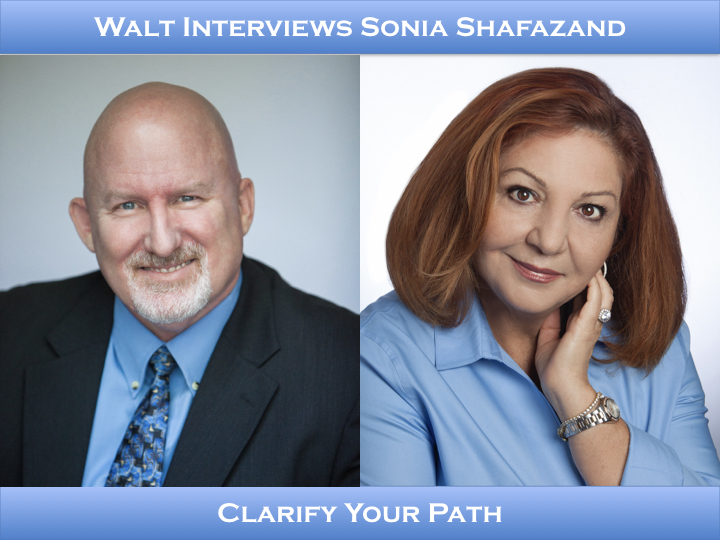 If not, Sonia Shafazand helps you clarify your path. Sonia Shafazand is a Life Coach & Mentor to those who choose to have a Better, Happier Life NOW. With two toddlers in tow, she moved here from Iran during the time the US was in the midst of the hostage crisis. Sonia admits to having very low self-esteem at that time. She attributes it to feeling guilty about the results of her country’s actions in the throes of revolution. Knowing she had to support herself and her children, she studied for her Masters’ degree while working full time. Her years in Corporate America were full – a marriage, raising a family, self-improvement classes and seminars. One day all the knowledge and experience she had acquired suddenly came together. When she decided to live an authentic life, she began to see real growth. People became attracted to her lifestyle and sought her advice. She spent hours with family, friends, and others helping them with their issues. That genuine interest in people’s growth and happiness became her calling. Sonia now works with executives, professionals, college grads, the self-employed, stay at home moms and students. She gets a profound sense of joy when she receives a call or email from a client, thanking her for the breakthroughs they’ve experienced and how happy they are.